LED ZEPPELIN fell in love with the presence of the secluded mountain getaway during their first concert there in 1970 and would unknowingly help launch a musical industry in the most unlikely of places. 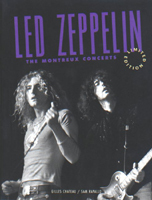 Led Zeppelin: The Montreux Concerts captures the magic created by John Bonham, John Paul Jones, Jimmy Page and Robert Plant in an extraordinary setting. The group's appearances there helped establish Montreux as a unique and exotic musical destination. Like Haight-Ashbury in San Francisco, the misty mountains of Montreux soon formed a hippie commune of its own, drawing people from all over Europe. Led Zeppelin: The Montreux Concerts explores the band's impact, and the people who were drawn by the town's timeless beauty and musical vibes. Co-author and photographer of Led Zeppelin: The Montreux Concerts, Gilles Chateau revisits his unforgettable experiences there in the late 1960s / early 1970s. An incredible never-before-seen collection of photographs provide a rare view of the group and community of fans that came to Montreux, with insightful interviews, research and text by Sam Rapallo. From their inception, Led Zeppelin's live concerts created an incredible buzz among fans around the world, playing in sold-out arenas and stadiums. As their popularity soared, it would be unthinkable for them to return to performing in a small theatre. However, Montreux was a unique and special place where the group could retreat from the chaos and get back to basics. Details of the 1976 Bonzo's Montreux recording session are also uncovered for the first time. Home of the famous Montreux Jazz Festival, founded by promoter Claude Nobs, it has played host to numerous super-star rock musicians and legendary rhythm & blues artists. This year marks the festival's 35th anniversary. Jimmy Page and Robert Plant took the stage again in Montreux in July 2001 as part of the Sun Records Tribute concert - their first appearance together there in nearly 29 years.